My BlogPress app just crashed, and I'm rewriting this whole thing from scratch. What do other modelers do that gets under your skin? They're all related, actually - I guess they'd fall under the bracket of professionalism. We're all enthusiastic about our hobby, and we like to share our projects with our peers. I personally believe that if we put ourselves in any public spotlight, we should show ourselves in the best possible way we can. This means being a bit less lazy with checking grammar and spellings (non-native speakers are excused 😜), and absolutely not swearing online. We learned all of these things at school, no? If we're producing awesome models (and we are), and sharing our work and advice with everyone, we should do it as if we were getting paid for it. I work for a print-and-online publication as my day job, and we all have to be super-detailed about our information quality control - even in my video department. I'm clearly getting on a bit - I'm in my mid 30s, whining about people swearing in blogs and on Twitter - but I see it this way: my kids will eventually (hopefully) be following the hobby, and following the same people I do for inspiration. I don't want them thinking it's normal to flame people just because they disagree with them. I don't want them ranting about football managers to their peers. 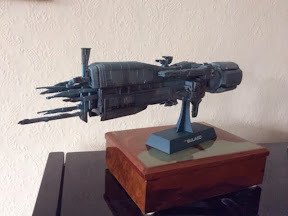 Getting back on-topic, hobby-wise, the last thing I want to mention is poor photography. I'm sure I'm at fault with this, too, from time to time, but I don't think it's in our best interests to take bad snaps of our finished models! WIPs are okay, but once the process of gluing and painting is over, taking a phone pic in the dark doesn't showcase the time and effort we've spent. Lighting, composition and focus; a clean background, and colours that are accurate to the model. If I'm trawling Twitter, and I see a 'finished' model sat on a cutting mat, with paint pots behind it, I feel a little disappointed. I want to see the detail. I want to be inspired by the model. I don't want to think "meh".